Bodhi, Bhikkhu, ed. and trans. 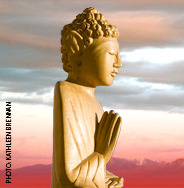 In the Buddha’s Words: An Anthology of Discourses from the Pali Canon (Boston: Wisdom Publications, 2005). A definitive introduction to the Buddha’s teachings in his own words. This volume is especially accessible because of the clear translation and systematic presentation. Bodhi, Bhikkhu, trans. Samyutta Nikaya, The Connected Discourses of the Buddha (Boston: Wisdom Publications, 1995). The authoritative translation of the one of the four great collections of the Buddha’s teachings. The Middle Length Discourses of the Buddha (Boston: Wisdom Publications, 1995). The authoritative translation of the 152 middle-length teachings. Rahula, Walpola. What the Buddha Taught (New York: Grove Press, 1959). A classic presentation of the key concepts of Buddhism by a Buddhist monk and scholar.